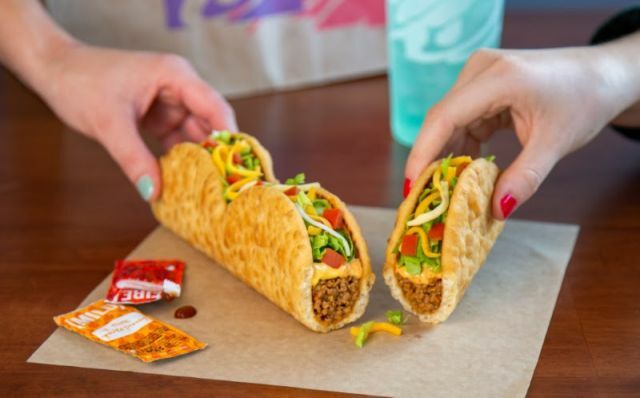 Taco Bell tests three interconnected mini Chalupas that they're calling the "Triplelupa" over in Orange County here in Southern California. The snack-sized Chalupas are connected by their shells end-to-end so that you can easily tear them apart. Each Chalupa comes filled with the standard combination of seasoned beef, three-cheese blend, lettuce, and tomatoes. Where they differ is that the Chalupa at one end comes topped with nacho cheese sauce, while the Chalupa at the opposite end comes topped with chipotle sauce. The middle Chalupa includes both sauces. The Triplelupa can be found at 12 participating Orange County Taco Bell locations through early December. It'll cost you $3.49 for one by itself or you can spring for a $5.49 combo that also includes a crunchy taco and a large drink. Orange County is where a lot of Taco Bell test items get their start as it is where Taco Bell headquarters is located.